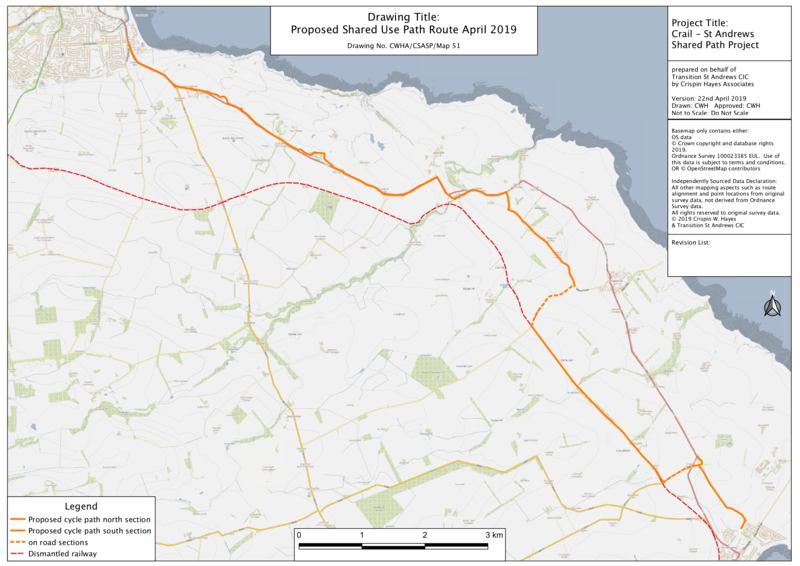 Communities from Crail to St Andrews are working on a long term ambition to connect up through a 11 mile shared path. This is part of a wider East Neuk 50 initiative linking Kirkcaldy to Dundee via a single coastal shared use path. Following initial engagement with landowners and communities we have now received funding and support from the Sustrans Communities Links programme to undertake a Feasibility study (Stage 3 Design) for the whole route in 2018-19. A steering group made of elected representatives, community representative structures, interested locals and businesses was initiated in 2017 and continues to meet on a quarterly basis to develop the path. If you are interested in helping out please get in touch. The next steps are to consolidate the steering group, get comprehensive landowner permission and formulate a maintenance plan, allowing the development to go forward. The link between Crail and St Andrews will offer a safer commute via bike and on foot, while providing tourism and leisure opportunities, with the Fairmont Hotel, Cambo and multiple Bed and Breakfasts all being connected via the path. We need to stimulate public support for the Shared Use Path in order to get local councillors on board with the project, encouraging involvement of Fife and Community Councils and creation of a maintenance plan, a key aspect in funding applications. This, along with comprehensive landowner consent, will allow funding bids for construction of the Path to go ahead. Why do we need the Multi-Use Path? The benefits of cycling and walking for our health, the environment and local economies have been widely researched and publicized. Regular cycling has been estimated, on average, to increase extra life expectancy by 14 months, through reducing the risk of heart attacks, strokes and cancer. In 2015 transport accounted for 24% of the UK’s greenhouse gas emissions, however the volume of carbon dioxide emitted, on average, per kilometre when travelling by bike is 13 times less than the volume emitted when travelling by car. On average, cycle tourists spend around £81 more per person per trip, injecting more money into local economies. In our feasibility study, 58% of respondents said the construction of a Shared Use Path would create a modal shift from car to bike use, while walking would also increase. The steering group meets quarterly and consists of elected representatives plus members of local communities and businesses. The next steps for the group are to involve local councillors and representatives from Sustrans, to engage local communities and become a more autonomous driving force behind the project. Steering group meetings are held across St Andrews, Crail and localities in between. Please email transition@st-andrews.ac.uk for more information on the steering group and how you can get involved. We also have a Facebook group, please join us to stay updated. Increase public awareness and support for the Shared Use Path through social media and the website to show local councillors the Path is important to local communities and businesses. Support the steering group in moving the project forward through publicising meetings and structuring the group, allowing it to self-administrate. Consolidate business, organisation and landowner support. If you are involved in an organisation or business in the area we would like to hear from you regarding your views on a Shared Use Path. Please click here to fill out our survey. If you would like to know more about the Shared Use Path or get involved in the steering group please email us at transition@st-andrews.ac.uk. You can also visit our Facebook page.